I want to make a Flying Geese Rainbow quilt, but don't know which material to use for the sky. Would you use 1, 2, or 3 ??? I vote for #3. I like your rainbow fabrics. Well, I'm no help. I'd pick #1. Maybe #2. Not #3. Isn't that funny? 3 votes and they are all for different fabrics! I love your rainbows and think this quilt could be awesome. Not that you want to bring another color to the suggestion box, but I think if it were mine I'd look for something in mottled grey. At first look, I said #3, but then looked again, and I like #1 best! I'm not gonna look again! LOL! Prefer the contrast with #3. I like the idea of molted grey. Otherwise, #3. I vote for #1 at first I liked #2 but I think 1 is the med of the three and would make a good choice. mottled grey or number 3 for me too. 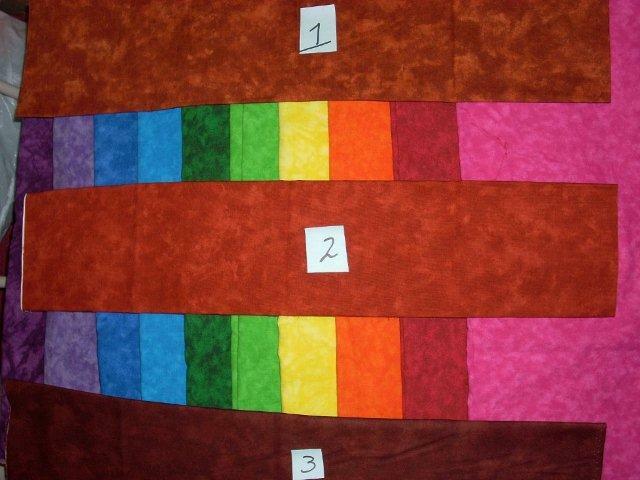 Though they are all lovely fabrics, I think they compete with the rainbow colors and will dominate the quilt. My vote would be for the mottled grey or another more subtle color for the sky. I like the idea of gray, black, or white. If not, then #3 - The #1 and #2 are too blendy with the red. I vote for 3, 1 and 2 are too close to one of the colors in the geese. Gray or black would be nice also! What is a Flying Geese Rainbow quilt? I would vote for number three.